We’ve got one hive with a queen that’s not nearly as strong as we’d like–spotty brood pattern, no VHS traits, progeny susceptible to deformed wing virus, etc… Sticking with our chemical free, strong genetics, beekeeping plan we’ve started rearing queens from our strongest hive to replace her, and get a few nuc’s going to over-winter for making new colonies next spring. Our strongest hive sits right next door to our weakest one, yet it shows no signs of disease or mites! So we didn’t even bother to test for hygienic behavior in those bees, we just know, ‘it’s the one’. One week later we had a frame with eight capped queen cells and two uncapped. On day eleven, just to be safe, we’ll pull some of the extra queen cells and put them in mating nuc’s, cross our fingers and hope the new queens ‘get lucky’ with some regional drones with hygienic traits. Encourage good honey bee genetics in your apiary by raising queens from your strongest hives. It seems obvious, but on the flip side, helping weak colonies ‘limp along’ with mite treatments and antibiotics is actually encouraging weak genetics among the bees, and strong genetics among the mites! How do you test for hygienic behavior? Read the article linked below to find out. 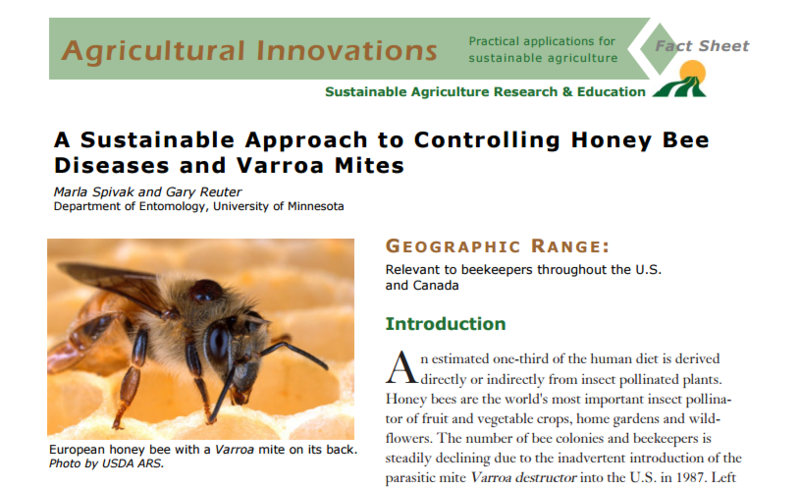 The varroa destructor mite causes all kinds of problems for the European honey bee. In addition to weakening the colon directly, the mite acts as a vector of several viruses, notably the deformed wing virus. Attempts to find insecticides specific enough to kill the mite, but not the bee have met with varied results. Mites have also developed resistance to several pesticides that initially appeared to be effective while other treatments are harmful to human health and must not be used when bees are collecting nectar. This ‘bandaid approach’ of annual treatments to knock down the weakest mites is only a short term solution, and one that ultimately weakens the gene pool of our regional honey bee population while strengthening that of the pest by ‘selecting’ for the strongest genes within the mites (the ones that survive the treatment). The keys to controlling varroa mites lie with genetics. It’s a genetic race, and with the mite’s life span so much shorter than the honey bee, there’s a greater opportunity for evolution by the mites when exposed to external pressures, like miticides. This problem is compounded by the recessive, multi-gene activation of hygienic behavior in the honey bee, making it more challenging to improve their genetics. 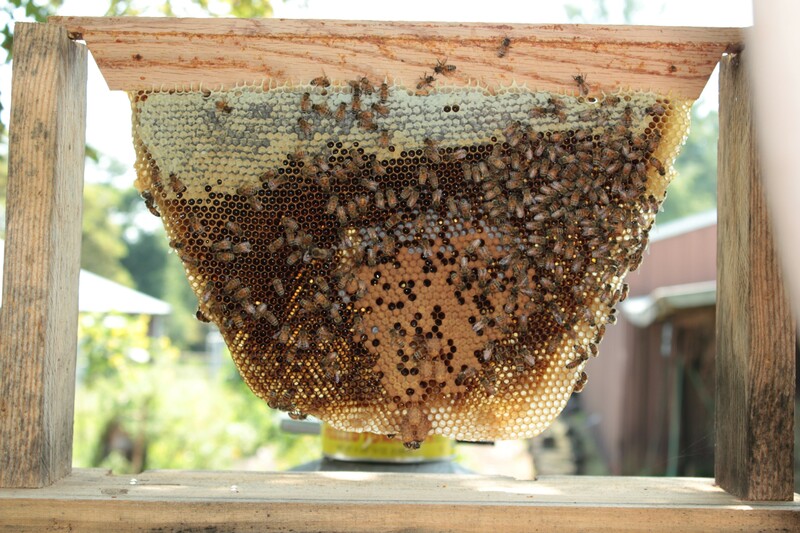 This article by Marla Spivak and Gary Reuter from the University of Minnesota’s department of Entomology demonstrates a method for determining if your colonies have genetically driven hygienic traits, something which can be easily encouraged within your bee yard! Encouraging hygienic traits has not been shown to have detrimental side effects, can reduce or eliminate the ‘need’ for mite or disease treatments, and benefits not only your bees but all the honey bees in your region. Why not try using the honey bee’s natural cycles, and encourage good genetics to help control mite populations without the use of costly and dangerous synthetic or natural pesticides, many of which are just as toxic as their man-made counter parts? Coordinated effort to fix the broken US food system. The Union of Concerned Scientists (UCS) has put together an impressive array of somewhat startling facts, and a road map to get us back on track to a sustainable healthy food system.